Below you will find just a small sample of the projects we have been involved with over the years. We would be honored to have your project join this group, so contact us today to learn how we can help - no matter the size and scope of your needs. We will be refeshing this group of project summaries from time to time, so you are encouraged to return as often as desired. 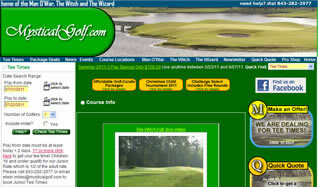 Mystical Golf (www.mysticalgolf.com), the web site home for The Witch, The Wizard and Man O' War golf courses in Myrtle Beach, South Carolina, provides easy to use features for golfers to book tee times and golf packages online in real time using an interface with the Tee-Links course management software suite. This web site includes online video overviews of each course, news and events, newsletter signup, online proshop, and customized golf package quotes. 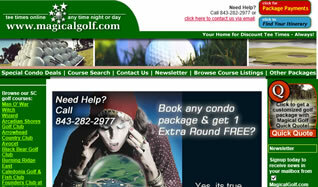 The project is also supported by a family of web sites for each of the courses, and a companion golf package web site. There is an extensive back-end system to manage the packages, news, newsletter management/distribution and order fulfillment. A golf package incremental payment process is supported and private features provided for golf package partners. The mobile platform version of Mystical Golf (m.mysticalgolf.com) is focused on the smart phone experience. This provides the capability to book golf tee times securely, explore special golf package offers, review each of the golf courses including a photo gallery, location map, scorecard and other information. The user can also contact Mystical Golf directly by phone or a contact form for further assistance or to request a 'quick quote' for a custom golf package. 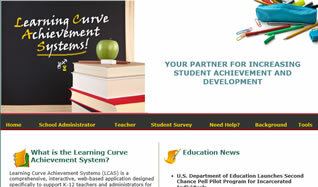 Developed in a cooperative venture, the Learning Curve Achievement Systems website (www.increaseachievement.com) provides a comprehensive, scalable, interactive, and secure support system for diagnosis of students, management of best instructional practices, and monitoring of student progress on a number of different assessments. The web-based platform allows educators to update student, teacher, and class and roster information making it easy to add new or transfer students to the system. Information from the LCAS website also aids in communication with parents and supports team-building between school and home. As soon as students have completed the diagnostic instrument, class and individual information is immediately available to the teachers and administrators along with recommendations about grouping, appropriate instructional strategies, and potential challenges within the class. Teachers are provided with templates of lesson plans and activities that predict increased levels of student engagement and retention of information. Talk to anyone who's lived in North Carolina in the last four decades and there's a good chance they'll remember eating more than one meal at Darryl's Wood Fired Grill (www.darrylswoodfiredgrill.com). One of the first casual dining restaurants, Darryl's was known for its off-the-wall, eclectic décor, friendly atmosphere, and unbelievably good food. But, it fell on hard times and was about to close. That's when new owners stepped in to rekindle the fire and bring Darryl's back to its original glory. The restaurant has undergone a $2 million renovation and expansion. 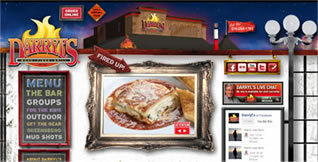 They've added great new features like outdoor fire pits, brought back the original Darryl's recipes, and put together a world-class team. The web site is the embodiment of Darryl's and features multimedia, an interesting menu presentation, jQuery features, social media interaction, online games for kids and more. Its supported by a broad and very capable back-end control system. Developed for the Android platform and available in the Google Play Store, this is an interactive golf course yardage book for the Burning Ridge Golf Course. Included is a hole by hole guide with layout, handicap and play hints. Also to be found is a map to the course, a photo gallery, food service information, golf package information and a query process for tee times. ForYou (www.foryouinc.com), a South Carolina-based corporation distributing premier products throughout the United States and Bermuda, began with a vision to develop a product line and program that would produce financially independent people. More than twenty years later, ForYou is still committed to developing these three Ps: Product, Program, and People. Based on a foundation of integrity, ForYou has built a reputation for superior nutritional and personal care products that have withstood the test of time and yielded proven results. 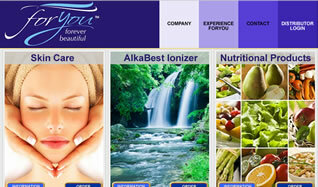 This web site features: an interactive media overview of the company, its product and programs; detailed information about all of the products; how to become a distributor - including the ability to join the ForYou family online; online support features for distributors; online retail product sales - including special pricing options for distributors only. All of this is supported online with a comprehensive back-end control system. 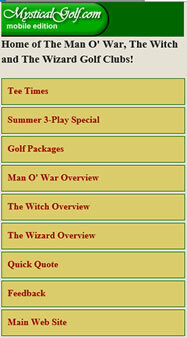 Magical Golf (www.magicalgolf.com) features 30 golf courses in the Grand Strand region of North and South Carolina, providing the visitor the ability to book tee times in real time for one or more of these courses as desired. 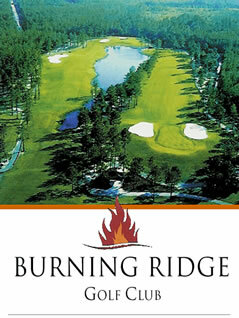 It provides a set of suggested course combinations for 3, 4 and 5 day/course golf packages. Magical Golf also serves as the entry to booking golf packages at the Mystical Resort condos for user selected dates, length of stay and available tee times for the included courses. The user is provided a low deposit requirement (subject to some limitations) and support for incremental payments by the group. The is an extensive admin system for condo check-in and management. Bear Swamp Lumber Co., Inc.